This is the first year we have hives during the winter. We have gotten some great tips from my brother-in-law on how to treat and store the frames. The popular way to store frames seems to be outside in the cold, but here in Florida that is not the case. The first step is to place the frames in a freezer for 24 hours. This kills off all wax moth larvae and eggs. By the way, the reason our frames got wax moth was because we left them sitting outside after we extracted the honey and moths got to them. We won’t make that same mistake next time. 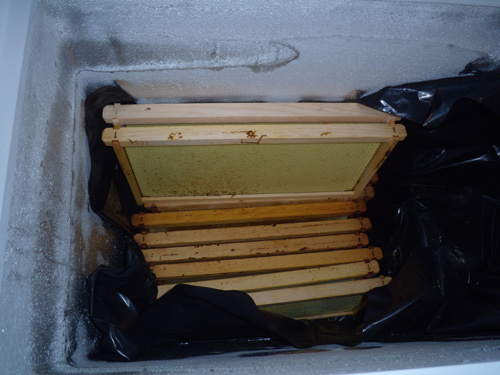 After you remove the frames from the freezer, let them sit out for a few hours so the moisture dries off. This prevents any fungus from growing on the wooden frames. Once that is done you can store your frames inside unused hive bodies. In between each hive body you can put a sheet of newspaper with dried lavender as a natural repellent for wax moth, then tape up and seal the hive bodies so that no new pests can get in. A local beekeeper also told us we can use Para-Moth inside the stored hives to prevent wax moth. Do not use this in live hives, with cut comb honey, or unextracted combs of honey. We prefer the non-chemical method. When spring arrives you can also treat the frames in the freezer for 24 hours again just to be sure they are clean and free of any pests. After we had our turkey dinner we got right down to jarring our honey. Maybe this will become a new Thanksgiving tradition. We were so excited to see how much we got this harvest. 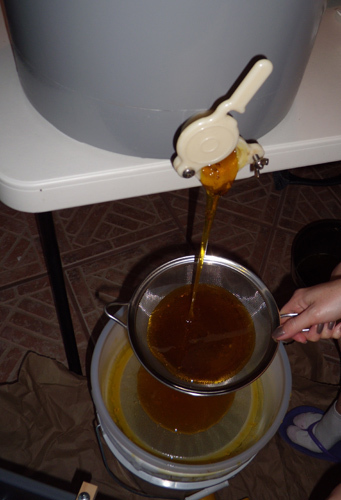 All this wonderful honey came from 2 hives during the Brazilian Pepper honey flow. All of our hives are doing great. All three have queens and look to be in good shape for the winter. We couldn’t be more thankful for our bees. Not much new and exciting to report this week, but we are getting ready for winter. Our “bad behavior” hive was still queenless and after harvesting honey we decided to combine them with one of the smaller swarm hives in order to help them overwinter. We are going to check how the combination went later this week. We are really hoping the “bad behavior” girls do not kill the queen from the hive we combined them with. Besides that we have removed all supers (those are the top hive boxes where the bees put their honey) and have each hive down to one deep body. 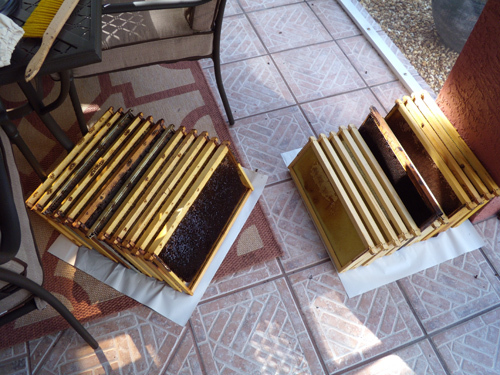 We got a tip from my brother-in-law in Greece (who is also a beekeeper) on how to store the empty built frames. After the bees have cleaned off all the leftover honey, you should place them in the freezer for a day to kill off any wax moth eggs. 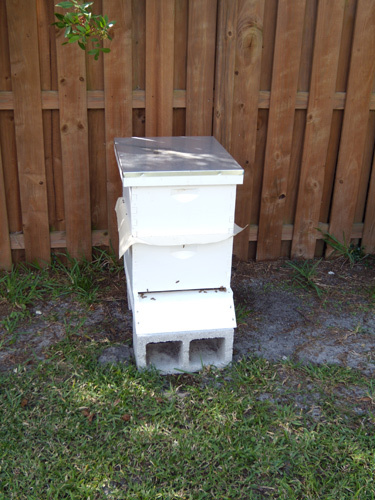 After that you can put them in an empty hive box and close them up or put them in a sealed plastic bag. My concern here is ants and roaches that may come after the wax and any leftover residue. 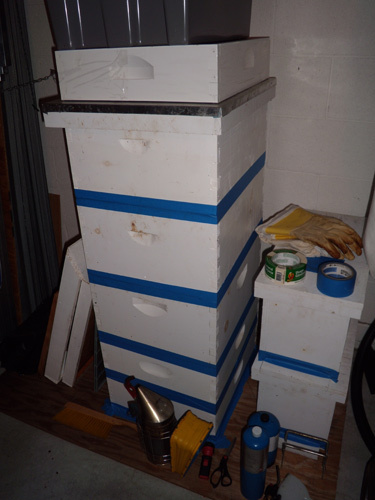 If any other beekeepers would like to share how you store your empty built frames to keep them safe from pests, I’d love to hear from you. 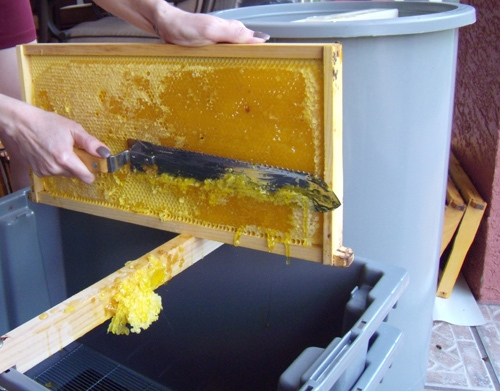 This is the part of beekeeping that everyone ooh’s and ahh’s about – honey. It’s the fruit of your labor. So what goes into extracting all that honey? Well I’m going to show you…and yes, it is a sticky mess. Step 1: Gather your extracting equipment. 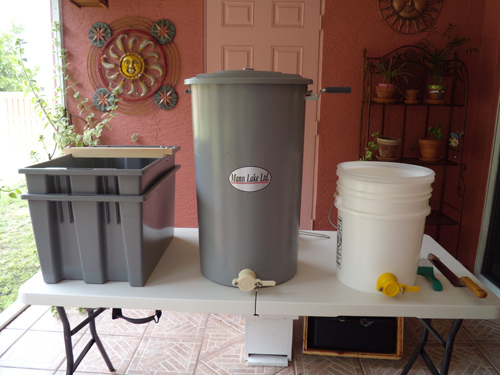 The basic items you will need is an uncapping bin, an extractor, a bucket, filters/strainers and an uncapping knife. Make sure everything has be thoroughly washed and is clean. Step 2: Gather your frames full of honey. Don’t worry, we still left some for the bees in their hives. Step 3: Begin uncapping your frames. 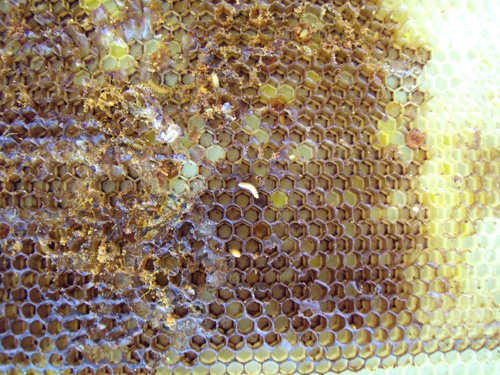 When honey is ready in the honeycomb the bees will cap it (cover it) with wax. This seals in and protects the finished product while it is still in the hive. 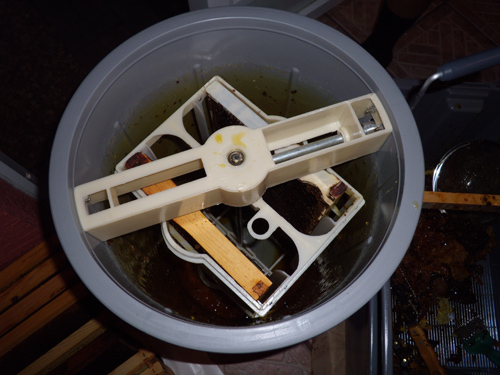 Step 4: Place your frames in the extractor to collect your honey. There are many types and sizes of extractors you can get, based on your needs and budget. Step 5: Filter, filter, filter. We run our honey through 3 filters. A coarse one that gathers the larger pieces of wax in the honey, a medium filter that catches anything the first one missed, and a very fine filter that will catch any remaining small particles of wax. Step 6: Wait. This is the hardest part! We let the honey sit for about 15 days. This gives the honey time to settle. All the air bubbles and any impurities will separate and allow you to skim it off. 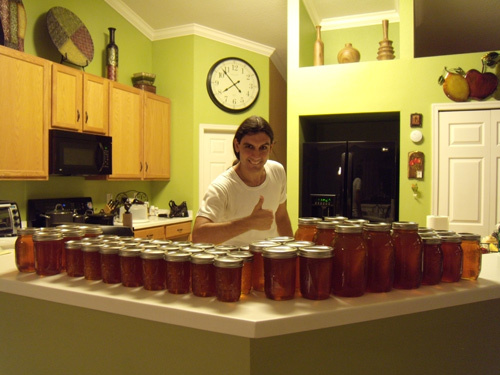 Step 7: After you have waited you can go ahead and jar your honey. I’ll post some pictures of that once we get to it.